Here are what you should know about the latest BBM update on Blackberry, Android & iOS. ==>Private Chat: You can now enjoy that X-rated private convoy either from a group or two persons. With Private chat, you can have an anonymous conversation, and the conversation will be deleted after one minute of no communication between the people involve. 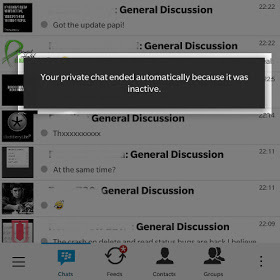 To start a Private Chat, open a normal chat window with the person you want to have a private chat with. On the top you'll see a new icon next to the BBM Voice/Video icons - a glasses icon - tap that icon. ==>Time & Retract Messages Now Includes Pictures: You can now also edit messages sent. To edit a message, tap and hold it and then tap Edit Message. The message will then be retracted and it will be available in the text filed for you to edit. Once you're done editing, just send the message again. There is no change to the way you send Timed Messages or Retract Messages. ==>Ability to Quote Messages: Groups will find this feature handy, since a lots of conversation takes place. If you or someone missed something and perhaps asked a question that was already answered, it can be copied and quoted. ==>BBM Stickers: Those who often uses BBM stickers, you can now rearrange your stickers colloections. Not just that but you can now update your status from the feed. This is a great improvement, if your bbm is not updated, then it is out of date. Note: Privacy and Control is part of a monthly subscription.